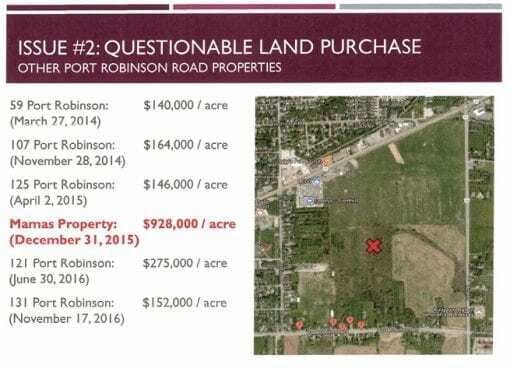 Actual private sectors land purchases in the Port Robinson road area are shown below, along with the Town of Pelham’s outrageous purchase of adjacent lands. WHY PAY $928,00 PER ACRE WHEN YOU THINK IT IS ONLY WORTH $600,000? The Town of Pelham was caught with giving a developer a sweetheart of a deal when it agreed to pay $928,000 per acre for land and issuing a nice fat IOU in exchange. But wait?! What is this?! The Town’s staff had estimated they could only get $600,000 per acre for the same area once the land was fully serviced. They must be pretty happy knowing they can get $928,000 for unserviced land (well, that is what Pelham Town Council is prepared pay, anyways).